You may think it is barking mad, but in Vienna a hotel arranges for dogs to go to the opera without their owners. If a guest wants a night out in the Austrian capital without his or her dog, but doesn't want the pooch to get lonely on its own in the hotel room, staff can step in. In addition to the more usual requests for dogs to be walked, the hotel can arrange for an employee to take the animal to the theatre. "If the pet wants to go to the opera by himself we will arrange their ticket if the opera allows it," says the hotel's general manager Monique Dekker. Image caption The Park Hyatt Vienna calls its canine guests "very important dogs"
"If he loves Madam Butterfly, then please go ahead." Meanwhile, other guests with a dog once asked the hotel to arrange some exclusive transport just for their pet. "We have had one dog that has been transferred by a limo because the guests were somewhere else, and they suddenly wanted their four-legged friend to come to where they were. For us the sky is the limit," says Ms Dekker. While most pet-friendly hotels don't go to quite the levels of the Park Hyatt Vienna, it is in fact indicative of the big growth in recent years in the number of hotels that allow people to check in with their dogs, cats or other animals. Bookings website Hotels.com says: "We have witnessed a huge increase in demand for pet-friendly hotels, and guests wanting to travel with their animals. "Demand is growing year-on-year, with a large proportion of hotels across the globe now not only accommodating for pets, but also advertising this key feature." Hotels.com says that a quarter of the 325,000 hotels it now lists around the world allow people to check in with their pets. For most pet-friendly hotels, guests wishing to bring their pets with them have to pay an initial surcharge. For instance, the Park Hyatt Vienna's "Very Important Dog" programme costs €35 ($40; £27). Food and other services, such as dog walking or sitting, or a trip to the opera, are then charged on top. 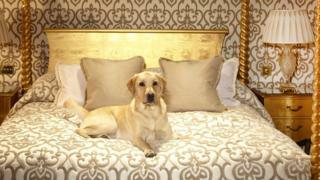 The Milestone Hotel in central London has its own "pet concierge". Georgia Wood, who holds the role, says the hotel does all it can to "make sure the pets have just as great a stay here as the guests". She adds: "We send a pet preference form prior to someone's arrival, and I'll just ask for the breed of the dog, the size of the dog, if there are certain things the dog likes to eat. "When we have this information, we can then, prior to your arrival, set up the room, set up the dog bed." In addition to offering dog-sitting and walking, the Milestone has an extensive menu for dogs and cats, which can be ordered as room service 24 hours a day. Dishes include "Woof Waffles" (two grilled potato waffles with a large Cumberland sausage, £5.50), and "Meaty Muncher" (chunks of steak in gravy, served with creamed mashed potatoes, £7.50). Ms Wood says that the hotel hosts three or four pets in an average week. Mostly these are cats and dogs, but occasionally a guest will bring other animals, such as parrots and rabbits. If a guest does arrive with a pet, they had better be sure that the animal is well behaved, because the Milestone - which is full of antique furniture - takes a £1,000 returnable deposit in case of any damages. Christine Fulton, head housekeeper at the Chesterfield Mayfair Hotel in central London, says hotels that allow pets are generally much more welcoming. "It makes the hotel feel like a home," she says. "Our team enjoy the novelty of having pets at the hotel, whether it is walking the dogs or babysitting animals while their owners enjoy time in London. "Many of our staff are unable to keep a pet for various reasons, and this gives them a chance to have the companionship of an animal for a while." Nadine Kayser, founder of dogs charity Wild at Heart Foundation, regularly travels throughout Europe with her husband and two rescue dogs Bally, a Romanian shepherd-mix, and Ivy, a Rottweiler-Labrador cross. "The most important question we always ask is: do they allow dogs?" she says. "Some allow them in certain parts of the hotel, which is fine for us, as long as they can sleep in the same room." Back in Vienna, Simone Dulies, the general manager of the pet-friendly Hotel Bristol, takes her dog Brix, to work with her every day. She says it isn't enough for hotels to tolerate pets, they have to make them feel genuinely welcome. "[The welcome for pets] needs to be honest, otherwise you see it as just a bit of marketing," she says. "My dog is like my baby, so if a hotel is nice to my dog, the same as it should be to a mum with her kids, then that's some major brownie points from me."